The worlds favorite full size popcorn machine. Extremely heavy-duty construction, welded aluminum frames, etches glass and "Antique Brass" powder coat finish. Includes the famous Whiz Bang high performance 12/14oz stainless steel kettle. 15 amp plug. 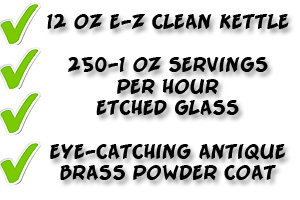 Produces about 250/1oz servings per hour.